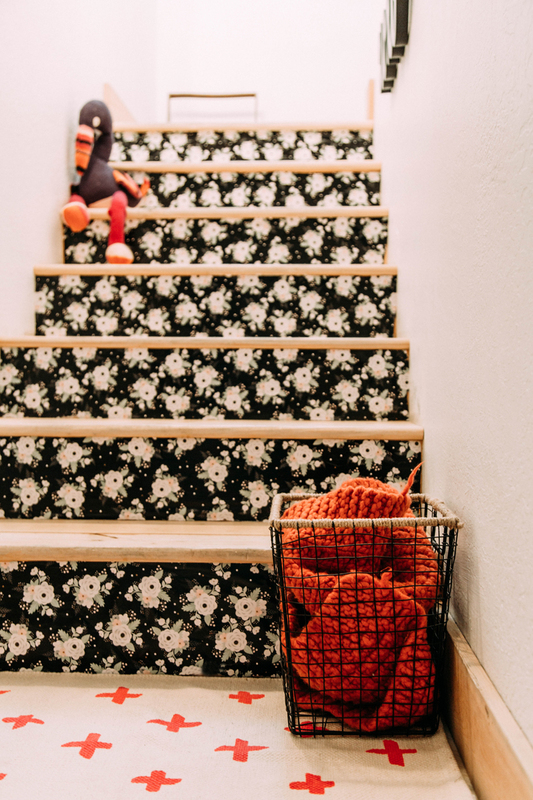 We’ve partnered with Mixbook and added an array of fun details to turn our dingy staircase at home into a bright and fun transition with wallpaper stair risers & the best large print family photos. When we first purchased our house the staircase was one of the FIRST things we tackled. The house was set up as almost 2 separate living spaces with a staircase in between. We immediately ripped up the carpet to get rid of a lingering smell and took out the exterior door that was in place at the bottom. Just doing this made a HUGE difference in how we felt about the lower level of the house. It sat like this for over a year as we moved on to more pressing matters like the kitchen and the bathrooms. And fun we had, creating a personalized staircase with wallpaper stair risers that brings a huge smile to my face, every time I walk down it. 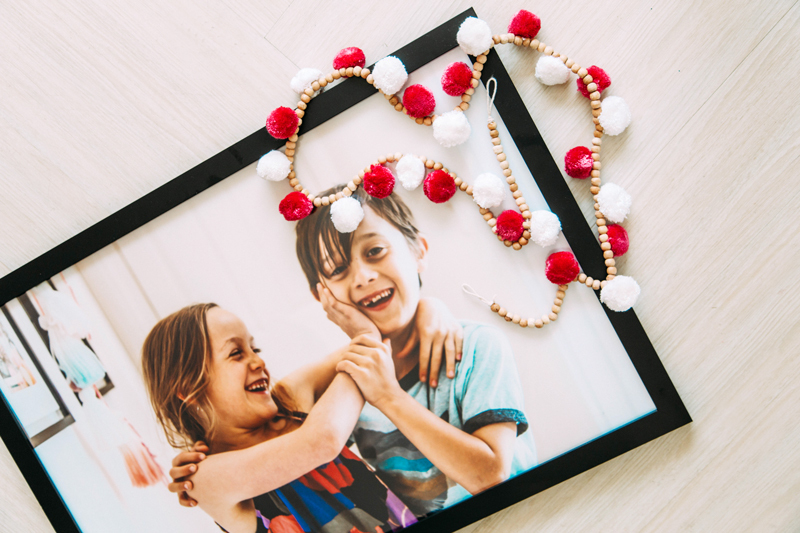 We used mixbook to create large poster prints of a few beloved family photos, they have the option to order the prints with frames and this was perfect. About 5 minutes of work online ordering the prints (it was so easy!) and about 10 minutes of work hanging them up made a gigantic difference in the space. I know we often think of sites like Mixbook as only for memory books, but I’ve been quickly learning the power that personalized home decor adds to a space. Great news! Mixbook wants to help you personalize your space as well. With 50% off poster prints! Expires 10/15/18 – Just put in SUB50 at checkout. 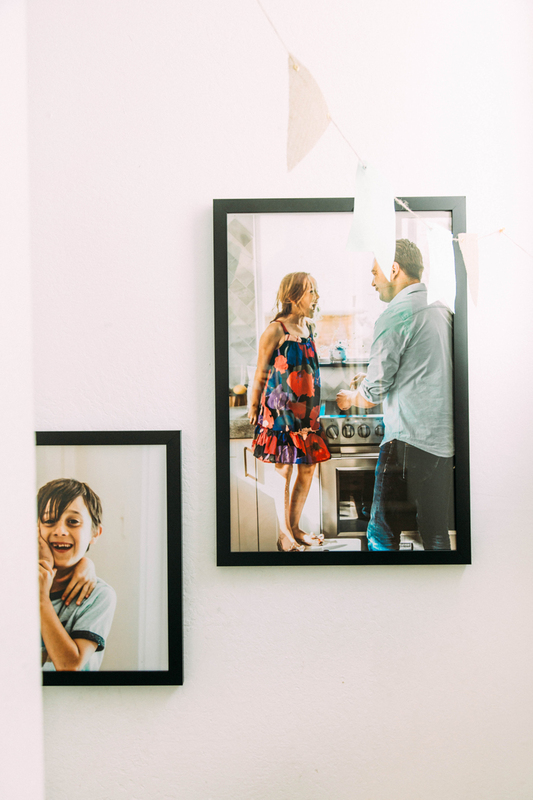 Large print family photos are more affordable than art and really makes a space happy for to walk through. This is the staircase that leads to the kids room, media room etc and it now screams our family style. 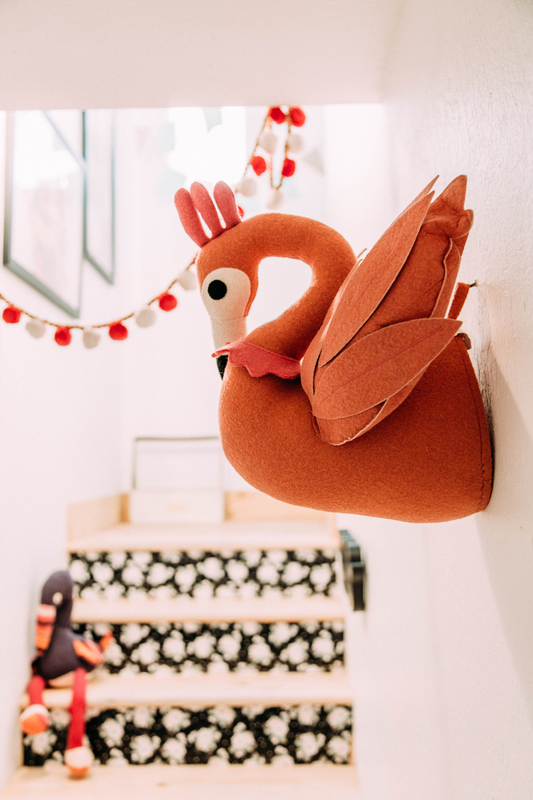 We added a few whimsical details to the space, like our hanging flamingo head and wooden bunting. The entire vibe feels like you might be entering a fairytale land. 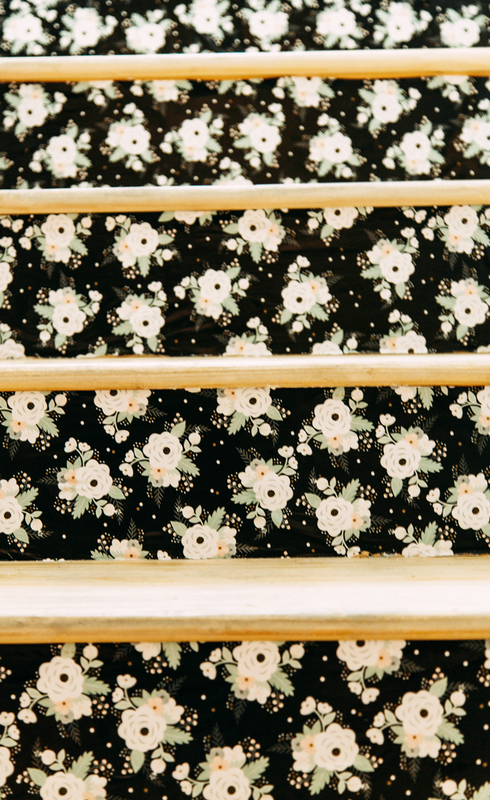 To create the wallpaper stair risers we used a favorite pattern. Ordered it as a removable wallpaper pattern, cut it and installed in about an hour. Instantly the stairs became 100% more personalized and fun. Update a ho-hum staircase at home with this easy stair riser wallpaper technique and the great thing is that unlike paint – it can be replaced, or removed whenever we might wish. I really had my heart set on doing a rainbow painted staircase, but realized for our family home paint wasn’t the best option to throw on the stairs. 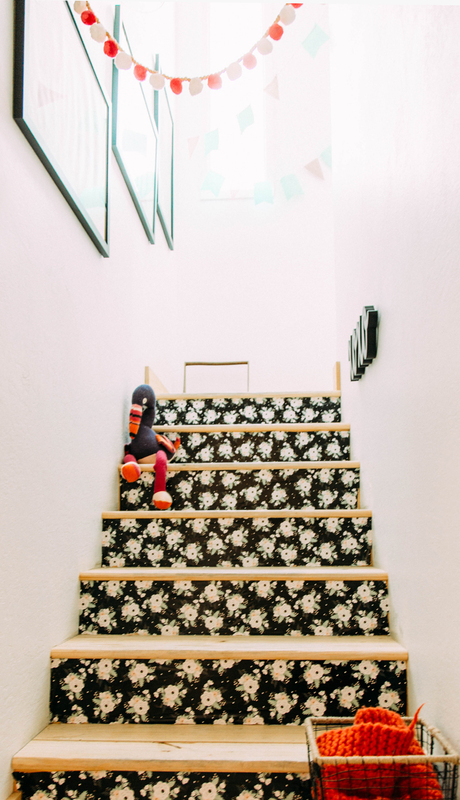 Instead this peel and stick wallpaper creates a fun look for the steps and doesn’t ruin our staircase for future design choices. Finishing off this personalize staircase look with Mixbook poster prints was really simple and easy. The frames I ordered were matte black and a great choice to allow the photos to shine against the dark colored wallpaper stair risers that we created. How do you hang family photos at home. I know the trend over the past years has been a more involved gallery wall. 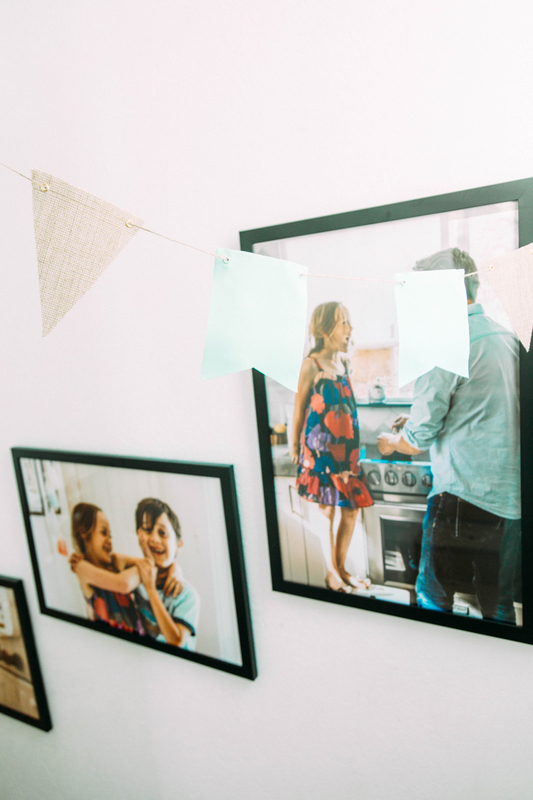 But for our space the large format prints, mixed with fun details like the wallpapered stairs and bunting are a great way to get that personalized look without all the eye clutter. Make your family photos today! Here’s a coupon code to create this look at home. 50% off poster prints! Whoohoo! Expires 10/15/18 – Just put in SUB50 at checkout. The paintings look beautiful. I like these pictures. How have the risers held up? Considering this on my stairs but don’t want to go to the trouble if they’re going to get nicked or damaged! Our ladders are carpeted. can you tell me how thick this paper? I will try our stairs.